You should probably be wary of a food that’s named after a bomb. A calorie bomb, no less. Italians like to use the phrase “bomba calorica” when it comes to describing something rich, fried and possibly cream-filled and there’s no hiding the fact that bomboloni do indeed satisfy all these requirements. These Tuscan pastries are like a doughnut, minus the hole, and usually filled with pastry cream or jam or often simply covered with a heavy-handed dusting of sugar. They’re the sort of thing you’d find at every country fair, market or festival around the region, freshly deep-fried from the back of a van. 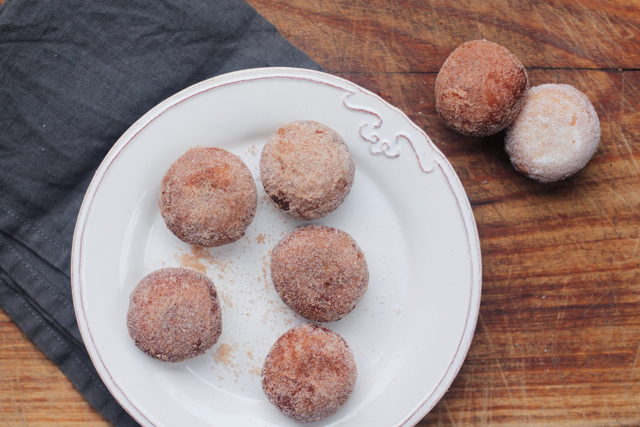 Many Tuscans have fond memories of eating bomboloni on the beach as an afternoon snack. Most pastry shops and bars have them too, making them a rather tempting breakfast companion with your morning cappuccino. Note, though, that you would never, ever eat these as a dessert after dinner (what, and go to bed with this bomba ticking away in your stomach?). Their smaller counterparts, bomboloncini (“little bomboloni”) are about half their size (think doughnut holes) and being small and bite-sized, they are decidedly less guilty of their bomba moniker, also because (if you like) you can skip the sweet or creamy filling and simply dust them in sugar and call it a day. 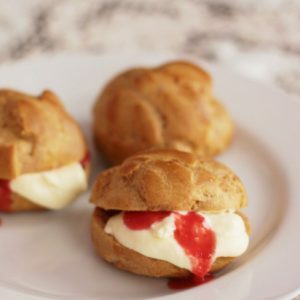 But you can still pump these little morsels full of custard, cream or jam as well. I’ve been baking a lot lately, partly recipe testing for a big project that I’ll soon be sharing, partly keeping away the winter blues (the oven heats up the kitchen nicely and baking provides a very good toddler-friendly activity when I have to keep the little one indoors – she’s great with the cookie cutter and egg-cracking!). So I’ve been off loading excessive amounts of baked goods to willing friends and one of them recently asked me if cinnamon or ginger ever get used in Italian baking and pastry making. Well, not so much, at least not in this case in Tuscan cooking, though it was a favourite Renaissance ingredient and certainly used in savoury dishes like this biancomangiare. But it was a great idea and had me craving warm spices, so although it’s not traditional, these bomboloncini were rolled simply in cinnamon sugar, something which brought me instantly back to childhood. I used to love cinnamon sugar sprinkled on hot buttered white toast, which occasionally, though more on the rare side, made a rather decadent start to the day. Well this is a little bit like that, but better. Unlike many bomboloni recipes these days, which are similar to krapfen, or northern Italian style doughnuts, this is a poorer cousin. 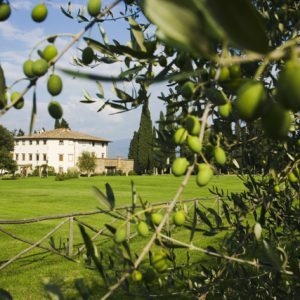 It’s a very traditional Tuscan recipe that does not call for eggs or milk but is rather more like a very soft bread dough that is then deep fried in vegetable oil. They are pillowy and somewhat lighter than krapfen style doughnuts. Old fashioned versions of bomboloni were even made with eggs, flour and the secret ingredient of mashed potatoes (some still do them this way). I didn’t think there was anything that could improve on Pellegrino Artusi’s recipe for bomboloni (he includes two recipes for them in his cookbook). But this version of bomboloni is just that tad easier as you leave out some of the ingredients. It’s in fact ridiculously easy, you just need a little patience and warmth to rise the dough. 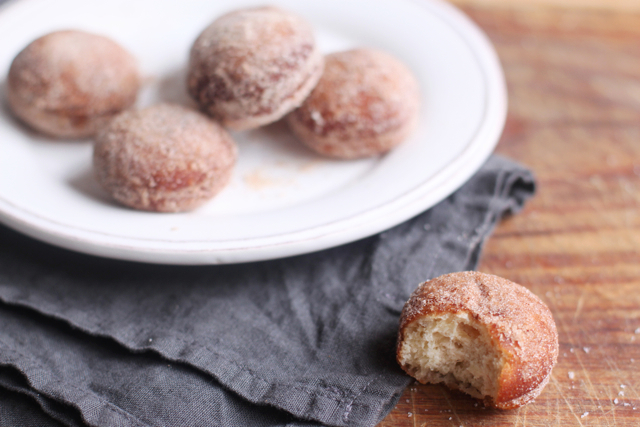 The same tips on making bomboloni or doughnuts apply here too. Don’t be put off by frying. 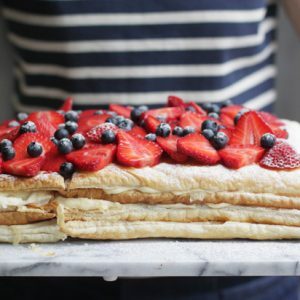 You can always bake these instead, albeit with somewhat different results (I’ve heard softer, less crunchy exterior, but haven’t yet done this myself). Frying is easy. Just make sure they are in a pot of oil deep enough that they float while cooking and be very careful with these bomboloncini as they fry at a relatively low temperature (about 160ºC), to get that crisp, golden brown exterior and fluffy interior. If you’re not sure of the temperature and don’t have a thermometer, test a cube of bread in the oil — it should turn golden in about 15 seconds. If using fresh yeast, dissolve it in the water until creamy. Combine all the ingredients (except the vegetable oil, extra sugar and cinnamon) in a bowl and combine until it comes together. You may not need all the water, you may need about 20ml more, this will depend on your flour and environment. Knead the dough on a floured surface until you have a soft and elastic ball, about 7-8 minutes. 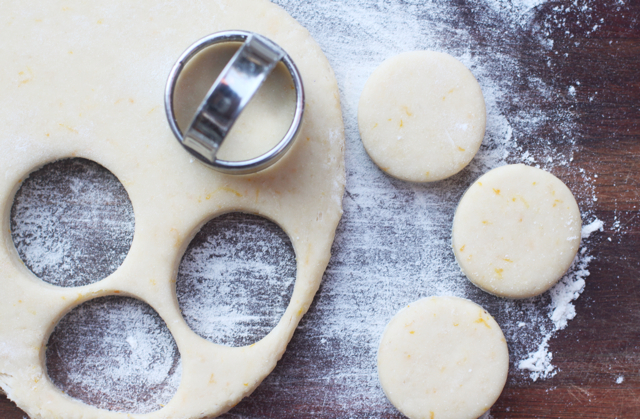 Place the dough in a bowl and cover with a tea towel. Let rise in a warm spot for 2 hours. In the meantime, combine the extra sugar and cinnamon in a small bowl to make cinnamon sugar. Roll the dough onto a lightly floured surface to about 1cm thickness. 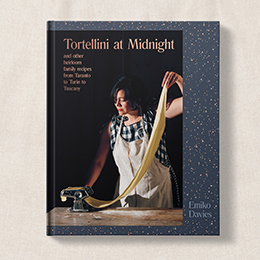 Cut out the bomboloni with a little glass (one that you might drink some vin santo out of) or a small round cookie cutter – I like one about 5cm in diameter. Continue until you have used all the dough. Deep fry in batches of 3-4 in a small saucepan of vegetable oil at about 160ºC for 2 minutes on each side or until golden. Drain on paper towels for a minute then roll in cinnamon sugar and enjoy while still warm. Looks delicious.. I love the way the name bomboloncini rolls off the tongue! Quite a few people have said that same thing to me recently! A divine treat! So comforting and addictive. Ok those doughnut holes are super cute and super fun to say! These are so cute and would make the perfect morning treat, I’ll take ten! For years I was really intimidated at the idea of making my own bomboloni or doughnuts or anything similar — but actually these are surprisingly easy! But once you realise that it becomes very dangerous unless you have lots of friends you’re willing to share them with! 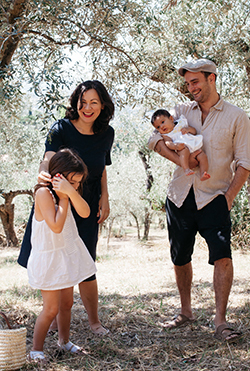 Ciao Emiko, I love your blog!!! Thanks Roberta! Unfortunately I don’t have an Italian language option on my blog, it’s only in English! But very soon I will start contributing blog posts to an Italian newspaper online and in Italian so please keep watching! Grazie per il tuo messaggio e a presto! Emiko, grazie mille della risposta!